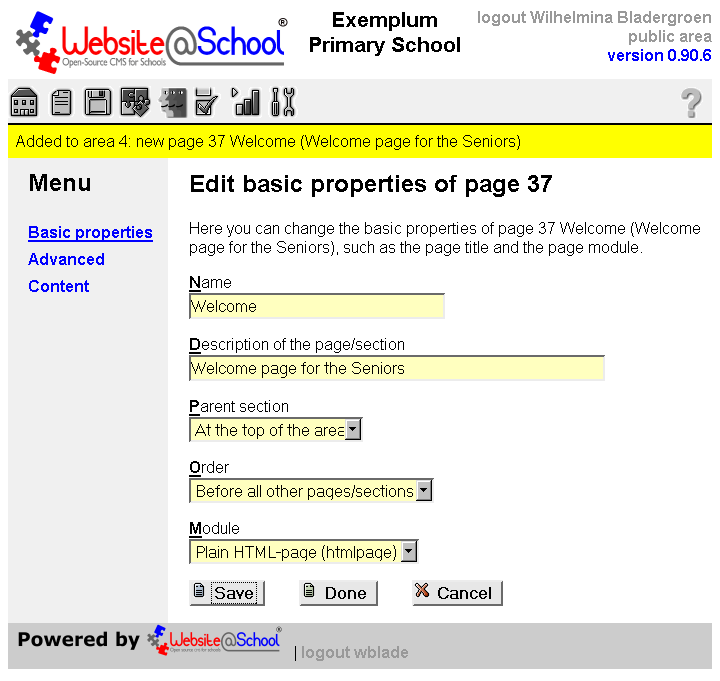 With the Page Manager you manage the website of a school. The website contains Areas. An Area is a separate part of the website that, for the website visitor, appears as a site on its own. Examples: the Area of the Board, an Area for the team, several Areas for teachers and their subjects, Areas for grade 3, 4, 5, 6, 7 and 8, for the parents committee, for all other workgroups, et cetera. Areas that are not publicly accessible are Private Areas (also called Intranets). These Areas are only accessible with a username and password. Everyone can have an Intranet, if necessary. In this way a the website of the school can contain dozens of public- and private Areas. An Area contains nodes. A node, in computer terminology, represents a basic unit used to build data structures such as linked lists and trees. 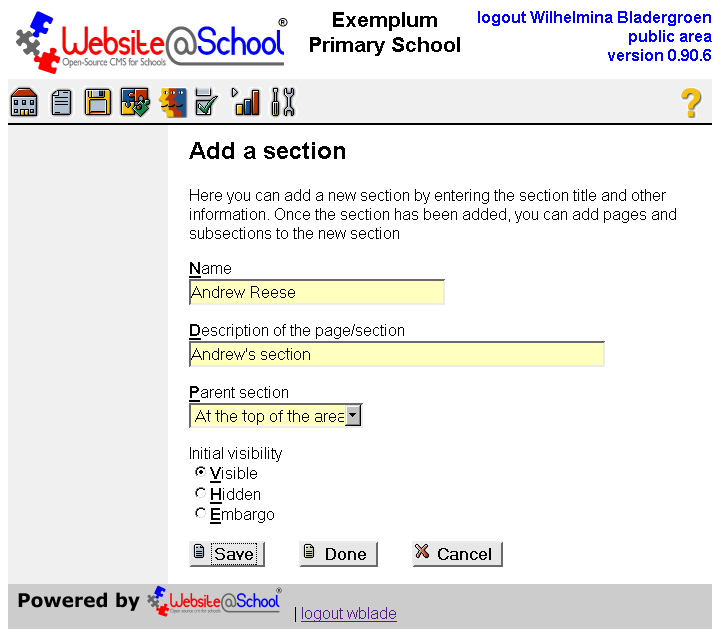 In Website@School nodes can be sections and pages in Areas. If one compares a site with a hard disk, the Areas resemble the partitions on the disk like C:\, D:\, etc. Sections are distinct parts of an Area. A section can be, for example, School info, Parents, Health Care, Poems, et cetera. Sections can contain sub sections, sub sub-sectons and even much deeper. To stay in the disk metaphor, sections resemble directories or folders on a hard disk. Nodes can also be pages. A page needs a module so you can do something with the page.A module is a self-contained component of a system, which has a well-defined interface to the other components. 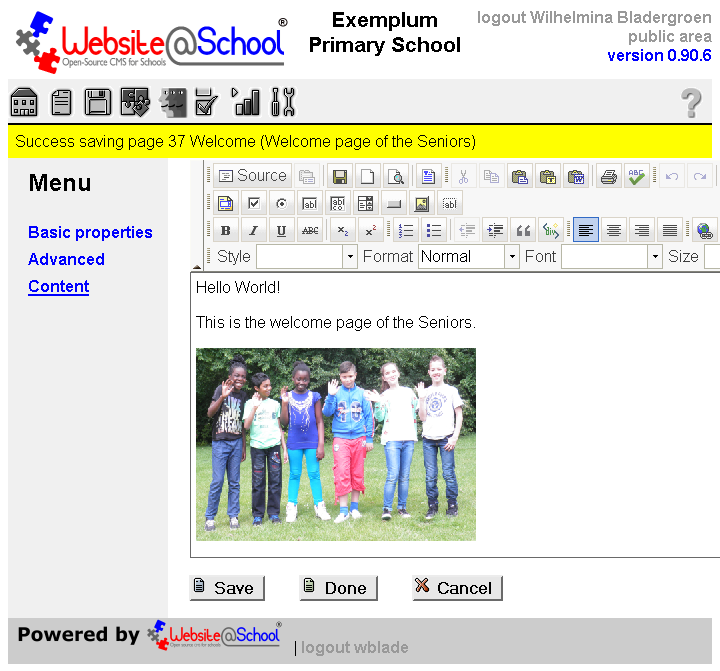 In Website@School a module can be virtually everything. A module can be a word processor to create pages with texts and images, like the 'School Guide' or a poem. A module can also be a Guestbook to fill out by your website visitors, or an e-mail page, a weblog, a chat, a Sitemap, a Forum, etc. To stay in computer terms, a page is like a file. And a file can be almost anything. For an overview of the available modules, see the Table of contents, paragraph Modules. The general idea of the Page Manager was described above. Below its main features are described in no particular order. General: Manage the Areas (Public and Private (Intranets)), sections and pages. Areas, sections and pages can completely consist of images, enabling navigation by illiterates, young children, display, strips, etc. Areas can be managed in the Page Manager, but not created or deleted. This is done in the Configuration Manager and is discussed in chapter Configuration Manager, paragraph 3. Areas. Sections: Create, edit and delete sections. Set properties of sections: the name of a section, a short description, the location in the tree (set parent section and order in that section), make a section read only or hidden, set embargo-, expiry date and time. Only icons can be used to 'name' sections, thus enabling a completely visual site for illiterates or young children. Pages: Create, edit and delete pages. 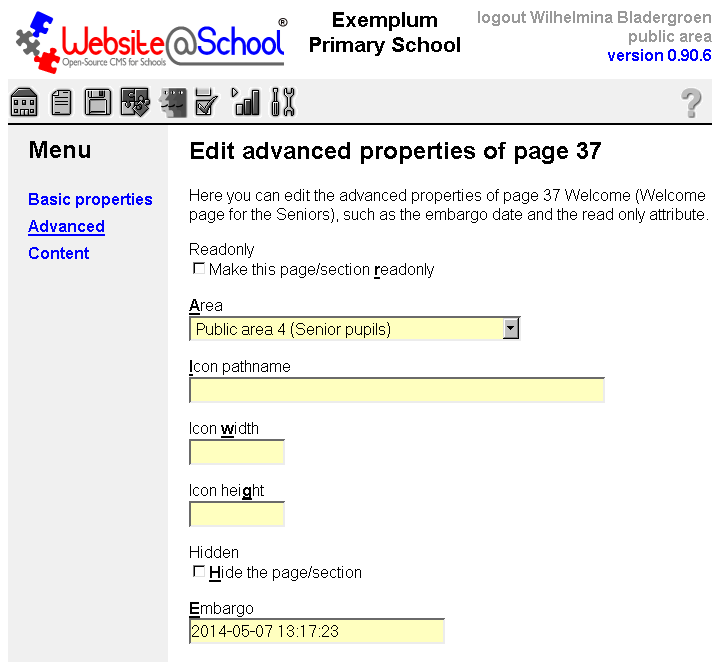 Set properties on pages: name , short description, change area, location in the tree (set parent section and order in that section), select a module for the page, make the page visible, hidden  or under embargo, set embargo- and expiry date and time, use icons to 'name' pages and define height and width. Hidden does not mean inactive. A hidden page is retrievable, if the URL is known. Selecting embargo and expiry results in inactive pages; i.e. not visible and not retrievable even when the URL is known. Grayed out: Public Areas, sections and pages you have no access to are grayed out. Invisible: Private Areas (Intranets) you have no access to are invisible for you. Bazaar Style Style: Edit style at section and page level. For an explanation, see appendix Viewpoints, paragraph 4.2 Bazaar Style Style. The technical details are discussed in chapter Bazaar Style Style. Move: Move Areas, sections and pages between Areas and sections. This feature enables easy manipulation of content and splitting or merging Areas and sections. Tree views: The mode in which the area/section/page tree is shown, can be set to maximal, minimal or customized. Module: Attach a module to a node (page). For an overview of the available modules, see the Table of contents, paragraph Modules. Locking: Sections or pages that are processed are locked. A locked section or page cannot be processed by other users. If another users tries to access a page in use, a warning message is displayed, telling who is processing the page. 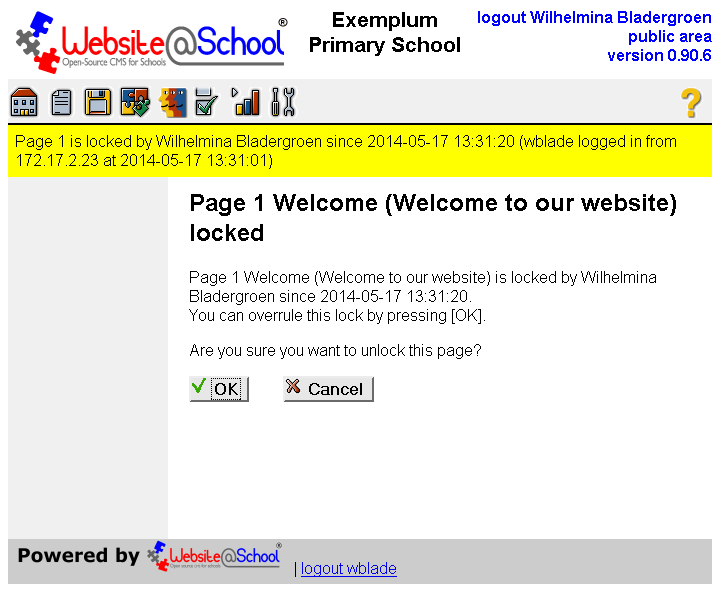 A locked page can be unlocked by its owner. If a section is locked, the underlying pages and subsections are NOT locked. E-mail alerts: Most actions in the Page Manager result in sending e-mail alerts. This is discussed in chapter Configuration Manager, paragraph 5. Alerts. 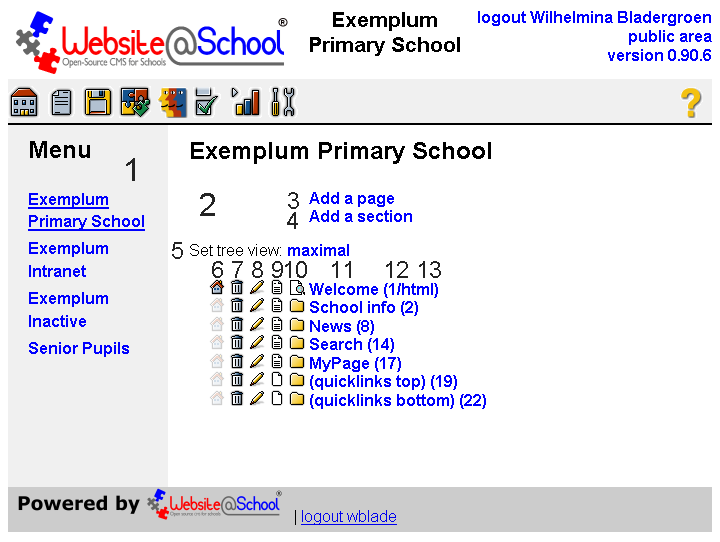 We also assume you have Guru permissions on a Website@School site with installed demonstration data. 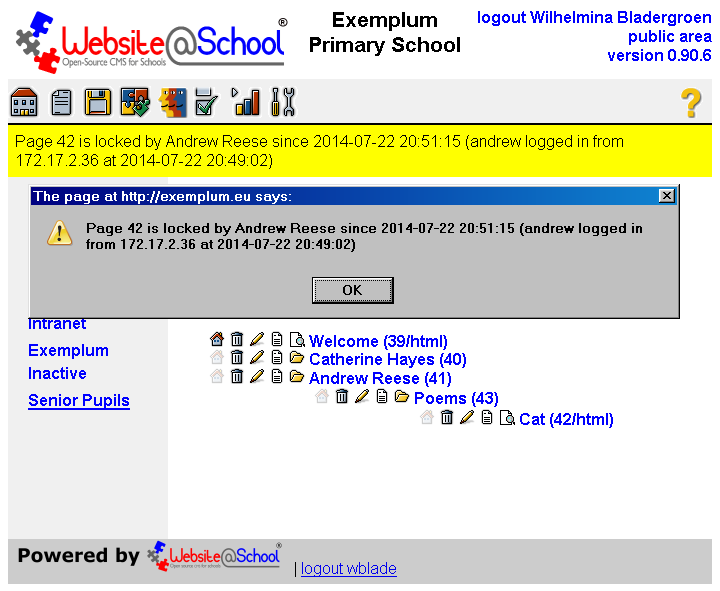 The Page Manager opens on the Exemplum Primary School Area, i.e. the Home Area, i.e the starting area of the site. For further details, please see the chapter Configuration Manager, paragraph 3. Areas. Area mode: The default mode. 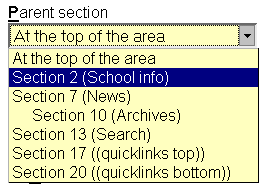 Clickable Area names give access to the sections and pages of that Area. The underlined Area is the selected Area. By clicking on an Area link, the Area is selected for management in the right pane. Areas you have no access to are grayed out (Public Areas) or are invisible (Private Areas (Intranets)). Areas cannot be created or deleted in the Page Manager. Please refer to chapter Configuration Manager, paragraph 3. Areas. Properties mode: When sections or pages are managed, their basic-, advanced- and content properties links become selectable in the Menu pane. Workplace pane: The right pane of the screen shows the title of the Area and it's pages and sections in the form of a 'bottom up' expandable tree. All sections and subsections are displayed minimal. When pages or sections are created or managed, the workplace is used for that purpose. Add a page: By clicking the link you enter the Add a page dialogue. This option is discussed in paragraph 3. Pages and its subsections. Add a section: By clicking the link you enter the Add a section dialogue. This option is discussed in paragraph 4. Sections. maximal: Fully expands the tree, showing all underlying sections, subsections and pages. minimal: Collapses the tree as much as possible. Only the root section(s) and page(s) are shown. customized: When certain section(s) were manually opened, whereupon maximal or minimal was selected, the customized link reopens the section(s) you had previously (manually) opened. 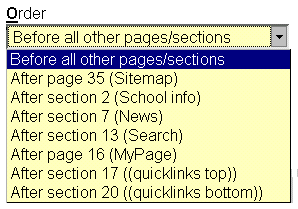 In the list of pages and sections, pages are associated with 6 clickable links: 5 icons and the title of the page. 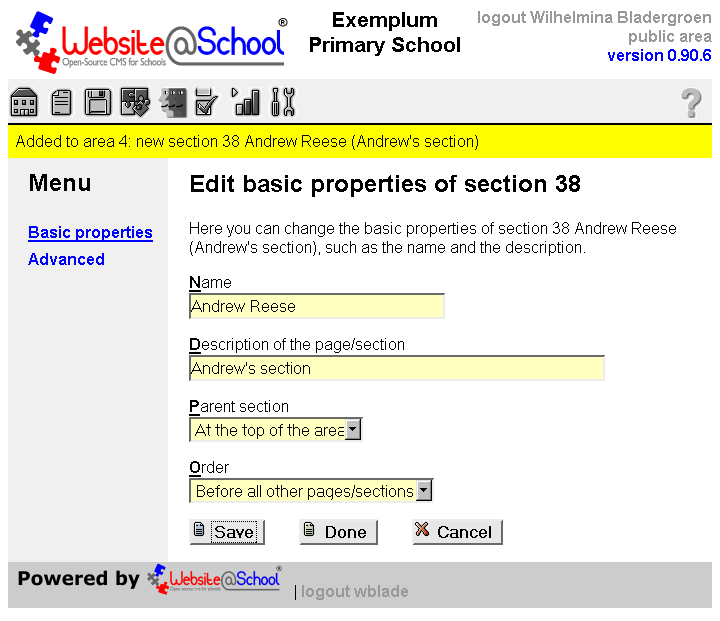 All 6 clickable links can be used to manipulate page or section properties one way or another. Some of the icons also provide a visual indication of a particular aspect of the page, e.g. is this page the default page or not, or is this page visible, invisible or hidden. NOTE: Capitals between '[ ]' (brackets) are for visually impaired, using the skin specially designed for them. See Account Manager section 5. Skins. Home or [H] or Not Home or [_] icon: A visible Home icon indicates the default (opening) page of an Area, Section or Page, i.e the first page seen in that Area or Section. A grayed out Home icon indicates that these areas, sections or pages are not the opening ones. Trashcan icon or [D]: Click to delete an Area, Section or Page. Pencil icon or [E]: To edit the basic properties of an Area, Section or Page. - 1. The icons indicate whether a page or section is visible, invisible or hidden. For the difference between 'invisible' and 'hidden', see chapter Page Manager, section 3.1 Add a page. - 2. Clicking on the icons opens the advanced editing options. - 1. Clicking the Page preview icon displays the content of the page in a new window. - 2. Clicking on the folder icon opens its tree structure and shows its underlying pages and/or folders. Clicking on the opened folder closes it. Page/Section name Page/Section name: Clicking the page name gives access to the page. Clicking the section name opens, like the section icon, the section folder. (n) n: The Section/page number. Every page or section has a unique number. 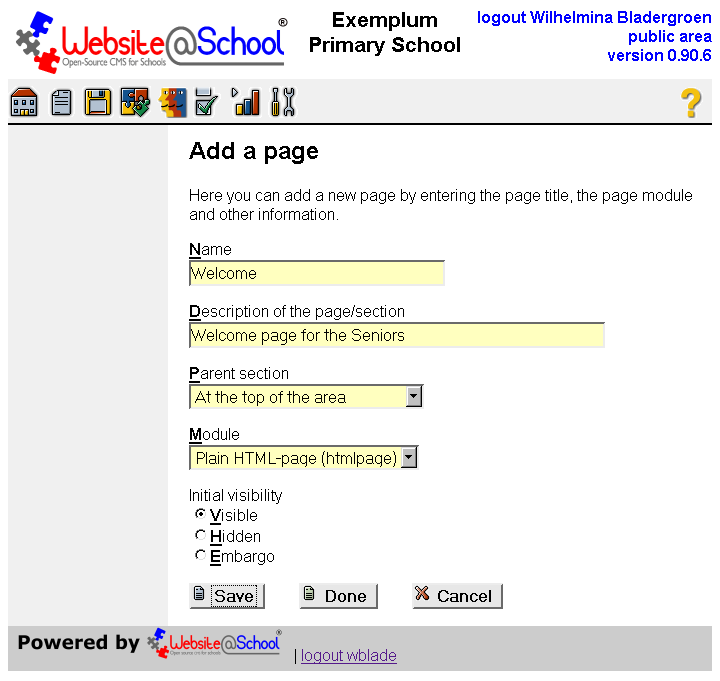 name name: The abbreviated name of the module connected to the page. These direct links can serve as shortcuts, saving you a mouse click. Name: The name of the page, for example: Welcome. In this field at least one character must be entered. If a space is entered (for example for a complete visual site), the Page Manager indicates the page as (page/section nn has no name) and in a breadcrumb trail the page is displayed as [nn]. Description of the page/section: In this field at least one character must be entered. 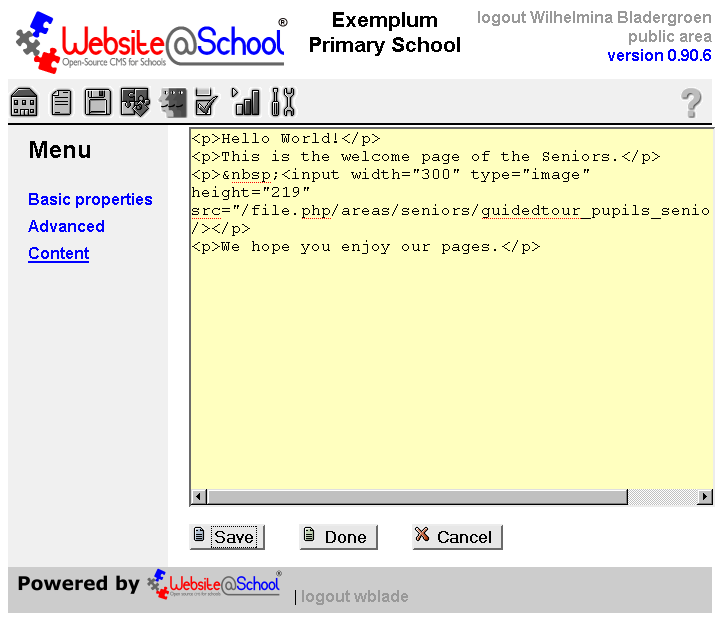 http://exemplum.eu/index.php/1/Welcome_to_our_website.html. Do not add the underscores, they are automatically added. The dropdown menu can be used to put the page at the top of the Area or at the top of a section. The place can be changed later on. If not selected, the new page will be placed at the top of the area. WARNING! Once you have selected a module and you have used it, i.e.you created data, changing to another module for this page destroys ALL data generated by the first chosen module! A better idea is to move this page to an (invisible) Archive section. In the dropdown menu select the module to attach it to this page (node). If the Plain HTML-page (htmlpage) is selected, it depends on the users preference, which text editor will be used (Plain HTML editor of F(CK) Editor). This preference is set in the users Basic properties. Visible: Once saved, the page will be visible. An alert will be sent. Hidden: Once saved, the page will not be visible. No e-mail alert will be sent. Hidden is the default option. This is a security feature. Hidden does not mean inactive. A hidden page is retrieveable, if the URL is known. Selecting embargo and expiry result in inactive pages; i.e. not visible and not retrievable even when the URL is known. Embargo: Once saved, the page will not be visible and not retrievable, even if the URL is known.. No e-mail alert will be sent. To set the embargo- and expiry dates, see paragraph 3.3 Advanced: Edit advanced properties of page nn. Name: The name can be changed. In this field at least one character must be entered. Description of the page/section: The description can be changed. In this field at leas one character must be entered. Parent section: Use the drowpdown menu to select the section for this page. If not already set when the page was created, it can be set now, if necessary in conjunction with the Order dropdown menu, discussed next. In the dropdwon menu select where to put the page in its section. The above two options enable you to move the page to all places in the Area. If you want to move the page outside the Area, see paragraph 3.3 Advanced under Area. Module: If absolutely necessary another module can be chosen here. When changing to another module ALL data in the old module will be lost. Maybe it's a better idea to move this page to an archive or make it inactive. Readonly [ ] Make the page/section readonly: Checking this option makes the page read only. This means that it's impossible to change its properties or delete the page. This is a feature. For example, when you have created HTML code, the FCK editor sometimes ruins your carefully created code when editing that page. By making a page read only, you have to think twice. Why did you make this page read only? In this dropdown menu you can select another Area for this page. The page will be moved to the top of the tree in the chosen area and can be further moved with the Edit basic properties of page nn dialogue, by using the Parent section and Order dropdown menus. Icon pathname: Instead of a page name, an icon can be selected as page name. Do not forget to put spaces in the Name and Description fields. /file.php/areas/grade8/pupils-284x71.jpg. A slash after /file.php! Icon width: Specifies the width of the icon in pixels. Icon height: Specifies the height of the icon in pixels. Hidden [ ] Hide the page/section: To hide the page, check this option. Hidden does not mean inactive. A hidden page is retrievable, if the URL is known. Selecting embargo and expiry result in inactive pages; i.e. not visible and not retrievable. yyyy-mm-dd hh:mm:ss. Notice the space between date and time. 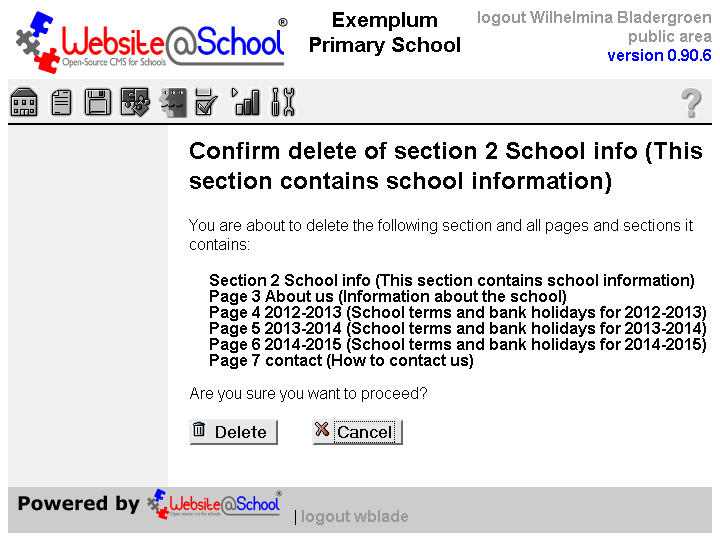 An illustration of expiry and embargo can be found in the demonstration data, in three different pages in the section 'School Info'. Clicking the Content link gives access to the configuration options of the earlier chosen module. Below are some examples. 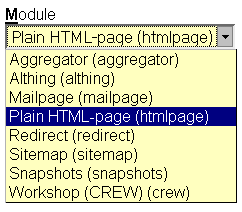 The chosen module was the Plain HTML-page (htmlpage). In this case this user has selected the FCK editor as her default word processor in: Account Manager > Users > <username> > Editors drop down menu > FCK Editor. The chosen module was the Plain HTML-page (htmlpage). In this case this user has set the Plain Editor as her default text editor> as her default text editor in: Account Manager > Users > <username> > Editors drop down menu > Plain Editor. 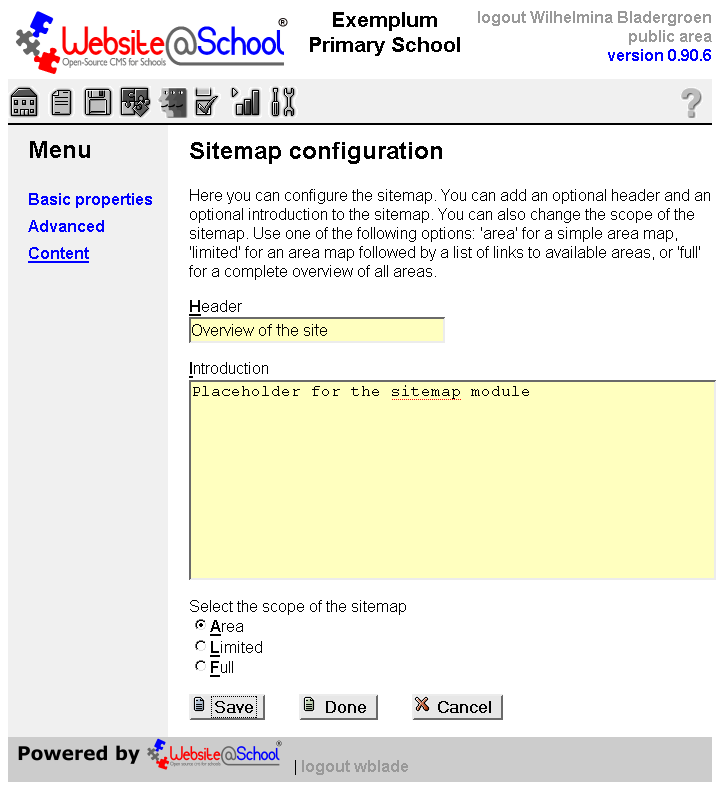 When adding the page, the Sitemap module was chosen in the Module dropdown menu. Management of modules can be found in their chapters, please see the Table of contents, under Modules. Your last chance to decide. Are you sure? Sometimes it's better to create an inactive Archive section to store once carefully created content. Delete: To delete the page. After deleting you will be directed to the Page Manager main screen. Cancel: To cancel your apparently unwise action and return to the page manager main screen. Sections are added, edited and deleted in exactly the same way as pages. Since sections can only contain pages, their only differ in that they lack the dropdown menu to add a module and the options to add a target and an URL. For explanations, please refer to 3. Pages because in this paragraph we keep it short only showing pictures. For the explanation, please see 3.1 Add a page. For the explanation, please see 3.2 Basic properties: Edit basic properties of page nn. For the explanation, please see 3.3 Advanced: Edit advanced properties of page nn. A section can be immediately deleted when it has pages in it. The pages will also be immediately deleted. 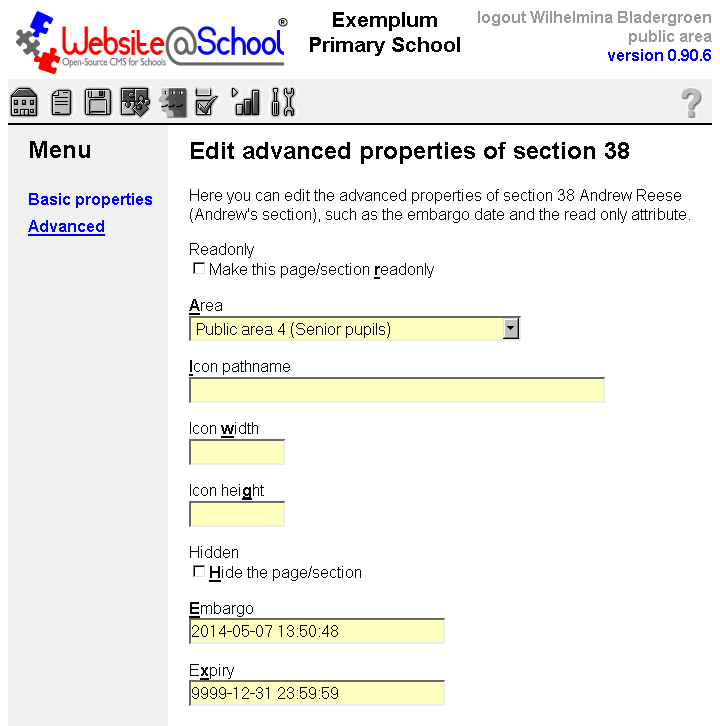 A section cannot be deleted if it contains non-empty subsection(s). These sections first have to be deleted before the parent section can be deleted. This is a security feature. Your last chance to decide. Are you sure? Is this section really useless? Delete: To delete the section and pages in it. After deleting you will be directed to the Page Manager main screen. 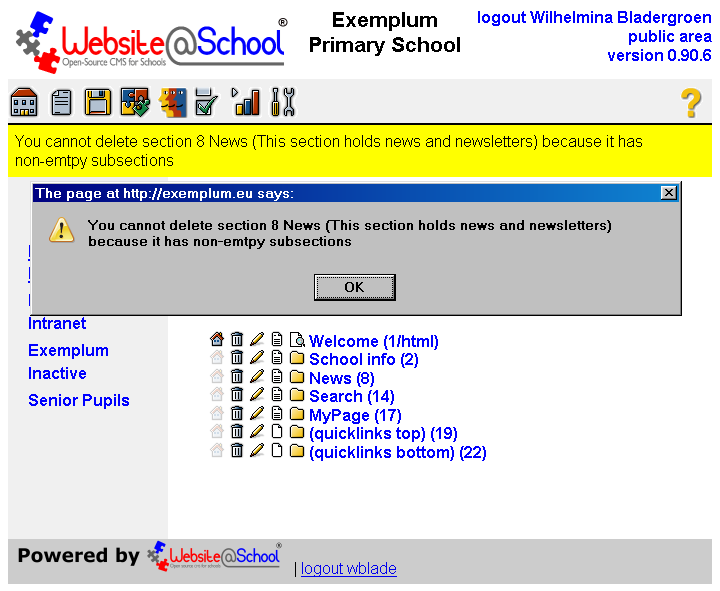 The directory contents of both 'School Info' and 'News' can be seen. You first have to delete the underlying section(s) before you can delete the 'News' section. Deleting a section with pages that are processed (i.e. 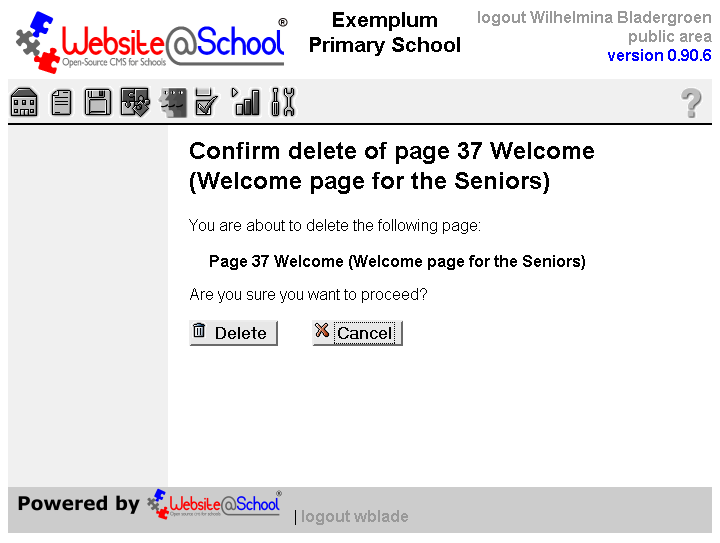 in use and thus locked), will delete the the empty sections and pages in it, but not delete the parent section and the locked page(s). You will get an error message. You first have to unlock the section or page before you can delete it. For details on locking and unlocking pages, see section 6. Locked pages. The content of Areas (Public and Private (Intranets)), i.e. sections and pages can be moved with the basic and advanced properties of pages and sections. It is not possible to change a Public Area into a Private one and vice versa. This is a security feature. Please bear in mind that (as example) images in pages, are possibly stored in their Area directories or subdirectories. Moving the content of an Area to another area will most probably result in links that need fixing. Users accidentally close their browser with an open session. For example by clicking on the 'X' in one of the top corners of the browser. Or a User tries to access a page that, at the same time, is in use by another User. Both actions result in a locked (unaccessible) page. Below both cases and unlocking the page are described. The page owner is the same person as the one who wants access to the page. Click the [OK] button to unlock the page. The page is accessible again. The message says that the webmaster Wilhelmina tries to open the page Andrew is working in. This means the page is in use and cannot be accessed by another User at the same time. NOTE: In this case, only the owner of the page has access to the unlock feature and must unlock that page. There is another way to unlock a locked page or section, see section 7. Session Tool in chapter Tools. Often an unwanted page or session lock occurs because a User's session crashed or the browser was closed without properly ending a Website@School session. 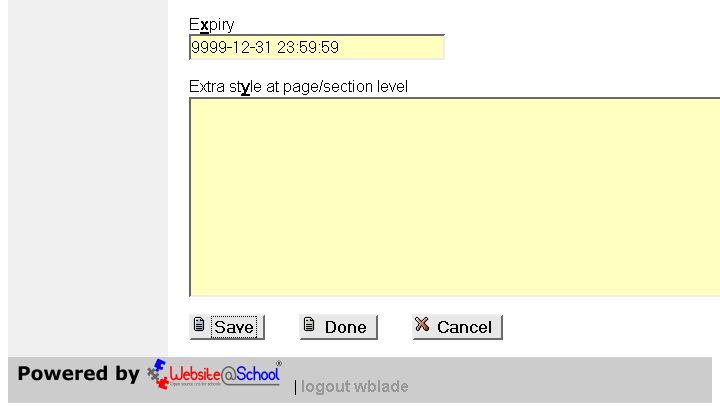 In this situation Website@School still considers the session as a valid one and hence the page or section remains locked, leaving it unaccessible for others. By forcefully ending the session of the crashed browser the page or section is also unlocked. Note that this requires the corresponding privilege for Tools (Sessions), see section 3.2.4 Administrator permissions: username (Full Name) in chapter Account manager.